I, Rt. Hon. 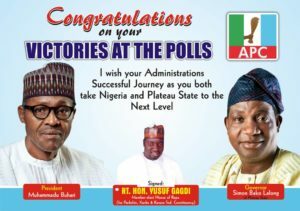 Yusuf Gagdi, Member-Elect, for Pankshin, Kanke, Kanan (PKK) Federal Constituency at the Lower Chambers (Green Chambers) of the National Assembly, on behalf of my Family, the Good People of my Constituency and the huge members and supporters of the All Progressives Congress (APC), heartily congratulates the President and Commander-in-Chief of the Armed Forces, President Muhammadu Buhari and the Executive Governor of Plateau State, Rt. Hon. 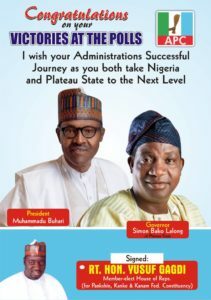 (Dr.) Simon Bako Lalong on their re-election into office, as President and Governor, respectively. 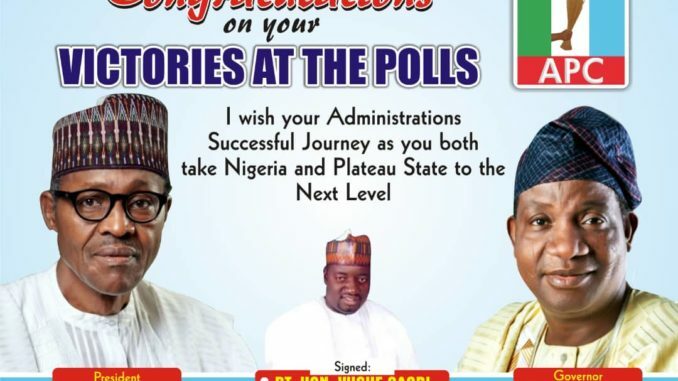 I want to also use this opportunity to congratulate Nigerians, especially, Plateau citizens, for their peaceful conduct before, during and after the recently concluded elections in the state. As I stated and made clearly in my statement before the general elections, elections are not a do or die affair. 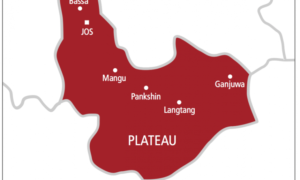 And true to type, Plateau people exhibited maturity and high sense of sportsmanship. I commend the citizens and voters for turning out in their numbers to exercise their franchise peacefully. I also commend all contestants, who lost and won the elections for not throwing the State into another round of crisis because of their ambitions. To those who lost, we believe there is another chance if there is life, as I call on winners to be magnanimous in victory. I humbly advise that those elected should have development of the country and State at heart by initiating programmes and projects that would impact on the lives of the ordinary Nigerians, especially by prioritizing in the areas of those who voted for them. As I congratulate the President, the Governor and all members of the National and State Assemblies elect, I implore them to see their victories as a call to service.